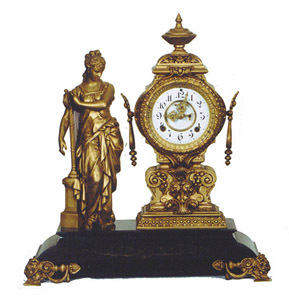 Ansonia Clock Co. figural clock, "Music", ca 1894. Figure and tower stand on a black enameled iron base. Statue, tower, and ornaments are finished in a Verde Bronze shade, or a golden antique bronze shade. Eight day movement is complete with the correct pendulum, and is running. Strikes half hour and hours on a gong. Two piece porcelain dial with the open escapement. Dial has a touchup at 9 o\'clock. Clock is 22 inches high and 19 inches wide. Ly-Ansonia No.502.